​Fishing with marabou jigs for trout has to be one of the best ways to land a trophy fish. Unfortunately it is not a method that is used a lot these days. Modern fishermen prefer to use newer flashier jigs for trout that cost a fortune and only get mediocre results. Marabou jigs are cheap, easy to fish and responsible for some very large trout being caught. They are also quite versatile on both rivers and streams and small lakes. ​What is a Marabou Jig? A Marabou jig is a small jig that has a dyed Marabou(turkey feathers) tail. 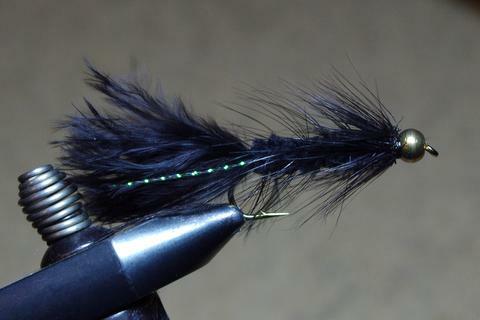 The body of the jig can have a chenille body and a dressed hackle. More often than not there is no dressing on the body and the tail or streamer of Marabou starts at the head. The head of the jig is usually weighed by a small metal bead. The beads can be painted a different color to the tail for added contrast. The Marabou jig is meant to imitate small aquatic insects that are found naturally in small rivers and lakes. Twitching the rod tip as they move through the water is what is meant to imitate the insects natural erratic movements. A lot of commercially available Marabou jigs are aimed at crappie fishing and not at trout. These types of jigs tend to have very flashy unnatural colors. Try to stay away from these types of patterns. For trout it is usually the most natural colors that work best. Black, brown, olive and white have been the best performers. ​Trout fishing with Marabou jigs requires that you work the jig in such a way that it has a bit of life in it. ​Unlike other trout lures a jig is effectively lifeless until you add a big of action into it. It is then that the Marabou tail can come to life. This action is normally by way of twitching the rod tip as it either falls or as you retrieve it a little. ​Your retrieve should be staggered, so use a start stop type of retrieval. Basically you want the jig to rise up as you retrieve it then pause momentarily so that it falls through the water. More often than not the trout will actually strike the jig as it falls. On smaller waters you can cast upwards of where you think the trout might be lying. Continue with this stop/start retrieval so that the jig moves just slightly faster than the current. Remember to add in some random yet light twitches through the rod tip. On larger rivers you can cast out in a fan like pattern to cover the most water. With the deeper water it can be a good idea to allow the jig to sink and then twitch it along the bottom, retrieving any slack as the jig moves towards you. Never allow any slack in the line as you need to keep in constant contact with the end of your line. Like most trout fishing setups that are used in smaller waters like mountain streams and small rivers the correct tackle for a fishing a marabou jig will be an ultralight spinning rod and reel. However, for getting the best out of these small jigs you would ideally be on the lightest tackle possible. ​Rod - Roughly 6 foot, with a fast action and a light/ultralight rating. You need the fast action for better and more sensitive tip control. Reel - A standard spinning reel for trout on light gear would be either a 1000 if you are using 2 lb line or up to a size 2500 if using heavier line. Line - Ideally you will want to be using 4 lb mono as your main go to. Only on much larger and faster moving rivers would you want to use 6 lb line. That being said 2 lb line is quite popular when using small jigs especially on really clear streams. Just be aware that when you do drop down as light as 2 lb you need to routinely check the line for any cuts or abrasions as it can get damaged very easily on rough rocks on the river bottom. Nothing is quite as rewarding as throwing small lures on light tackle along small mountain streams and slow moving rivers. The best trout lures for rivers and streams are usually the most simple. They have been around for decades and can be found in almost any tackle shop. Spinners, small spoons and little baitfish/minnow imitators. If you started fishing at a young age then you are probably all too familiar with the lures listed below. These names are almost legendary for their ability to catch picky trout: Mepps, Rapala, Panther Martin and Rooster Tails or even a simple jig like the Wholly Bugger. The Rooster Tail has a dressed hook(commonly referred to as a hackle). This hackle gives it a very like presentation. It can be a serious advantage over a regular spinner mostly when trout are feeding on small insects right before a hatch. With a huge range of colors and patterns available there is one to suit just about any light/weather condition. Size wise you should aim to be using 1/8 ounce or less. I usually find the more natural colors to be the most reliable. Fishing a Rooster Tail for trout is just like fishing with any other trout spinner. Cast across and slightly upstream of where the trout are lying. If you are fishing a larger river or some fast water then the Vibrax from Blue Fox is one of the best trout lures to choose. They perform best with a quicker retrieve rate and in a fast flowing river this can really force a strike from a trout that is sitting in a hole waiting for it's next meal to swim by. I tend to favor either the gold or silver blade. Often in fast water you'll find a blade that is more reflective than a patterned one will work best. They are also quite good for casting longer distances due to the weight of the body. Arguably one of the most realistic lures ever made the Original Floating in either a gold or silver can be deadly if fished on the right stretch of water. These lure are quite light so to get the best out of them you will need to on ultralight spinning gear. Sizes #7 or lower. They are also available in a neutral bounancy and in a countdown model if you do need to work much deeper water. Color wise the gold and silver are ultra reliable. There are also imitation patterns available that mimic perch, brown trout and rainbow trout. In really dark waters you may want to try some of the darker options such as Firetiger or an orange and gold. The Luhr Jensen Krocodile is a slim bodied spoon that works great on darker waters especially if there has been a lot of rain. The slim design means they can be fished fast. They come in a fairly large range of colors most of which will tend to be pretty bright. On duller days I'd stick with a classic gold or chrome without any of the added artificial patterns as some of them ca have very bright unnatural colors. Like the Rooster Tail, Mepps and Vibrax the Panther Martin is a classic spinner. What sets it apart from other spinners is it's blade. The inline blade that it uses is has it's shaft actually running through the blade. This allows it to spin very quickly and create a lot of vibration through the water. Size wise they do tend to be a little bit smaller than some of the other brands available. If you are looking to fish a larger one on bigger rivers then the 1/8 ounce is a good choice. The 1/16 ounce is a great trout lure for streams as it can be run in very shallow water, a great little lure for brook trout. If you are in need of something a little bot heavier than the Panther Martin then a Kastmaster spoon will fit the bill. These trout spoons have a very distinctive thick body. That thicker body means a lot more weight and you really can smash out some long casts even in the smaller sizes. The traditional gold color is easily the most popular choice with blue/silver as a close second.​ Saying that there are quite a few different color combinations available so you can play around a little with these to see what works on your local river. The 1/12 ounce is particularly good on small streams as it's small size makes very little splash but still has enough weight to make some decent casts. They range in size from 1/18th of an ounce up to 1/2 ounce. For trout on rivers and streams you should be looking at the smaller sizes. They are available with both single or treble hooks and with a hackle or dressing or just the plain hook. The Phobe is a small lightweight spoon that is particularly effective on streams and smaller rivers. They are a one piece shaped spoon that has a very unique curvature and finish. They can be fished quite shallow in the water due to their small size and weight. Probably the second most populat stick/minnow bait after the Rapala the Rebel minnow is a full hard bodied plastic lure. They have a fairly similar swim action than the Rapala but are probably better for casting as they are a little heavier. If the Kastmaster above is too heavy for your local river or you are fishing a lot in small mountain streams then the Acme Little Cleo is a great alternative. As the name suggest this little spoon is quite small, and also a lot lighter than the bulkier Kastmaster. A very simple design of presses metal it gives the traditional spoon like wobble that can set trout off. Gold is the one to get. What Kind of Tackle for Rivers and Streams? For most of the trout fishing lures featured here you are going to want to use an ultra light spinning setup. Lightweight trout rods should generally be in the 5.5 foot to 6.5 foot range. Any longer than that and you can have an issue with trees and bushes. Keeping it short also makes working the lure along a bank full of vegetation a lot easier. Look for a fast action rod that can give you pin point accuracy. Spinning reels for trout can be in the 1000 up to 2500 size range. Always buy a good quality reel with a decent drag on it. Line will usually be monofilament in the 2 to 8 lb range but for most applications 6 lb should be fine. Try to target trout were they will naturally wait in ambush along a river. Look out for sunken logs, deep holes and gravel beds especially were the level changes from deep to shallow. Fishing a trout jig is a little different than working a spinner or trolling with a large crankbait. Jigs require a little bit more finesse and for you to be able to feel what is going on as you work the jig to give it a more life like action. ​Because of this, how you fish them is a little different to fishing with a spinner or spoon. Jigs need a little bit action to mimic the short erratic movements that small insects make as they are carried downstream by the river current. Trout jigs traditionally were made from natural hair and fibers. However, a lot of modern jigs are made from artificial plastics. One thing that a lot of jigs for trout have in common is a weighted head. The head is usually made from lead and helps the jig move a bit more naturally. If also helps with casting. Without the added weight you would struggle to cast them any great distance. Marabou jigs have been around for over a century. They are very similar to a wet fly that imitates a young sub-aquatic insect. Most will have a dyed marabou tail and some form of dressed body on the hook. The dressed body can be made from chenille and or other dyed furs. And they may also have a hackle that is would down the body towards the tail. Many patterns will have a weighted head. The weight adds extra life to the jig as it moves through the water. Soft plastic jigs are usually made from a soft artificial material. They can be threaded onto the hook just like a worm. Some may already come on a hook. There are a few different designs available and will generally have a long tubular body with some form of tail at the end. Tube jigs are pretty basic. They are just one uniform piece of soft plastic that at best will imitate a worm. You can find some that have a sprayed on scent to help attract the trout more. The tail may have a tail with a few slits in it to help create a little movement. The most basic way to fish a jig in a river or stream is to cast it with o added weight on the line. You'll be relying on the weight of the jig head to help to achieve a decent cast. With nothing but the jig on the end of your line you will be able to twitch the tip as it moves along with the current. This movement is what will help give a more life like appearance. You can either let the jig drift down naturally along the bottom or raise your rod tip up and try to keep it suspended off the bottom. Bouncing a jig on the bottom will of course increase the risk of getting snagged. The other option is to work it under a bobber or float. With this approach you can ensure that the jig never snags on the bottom. You can use the float to set the desired depth at which you want the jig to be suspended at from the river bottom. The main drawback with using a float with a jig is that you cannot really add a movement to the jig by twitching the rod tip. To do so would make the bloat splash about on the surface, which could in turn spook a wary trout. For super finesse trout jigging you really do need an ultralight spinning setup. If you are not using a float then the sensitivity of the tip in the rod is super important. The rod needs to be light and have a fast action. Most spinning rods for trout fishing will fall somewhere into the above ranges. On really small streams you can drop down to a 5.5 foot rod. The line should be around the 4 lb mark depending on the waters you are fishing of course. On really small streams and creeks you can drop down to 2 lb line. Line this light will really help with casting. The reel should as ever match the line. A spinning reel in the 1000 to 2500 size range. 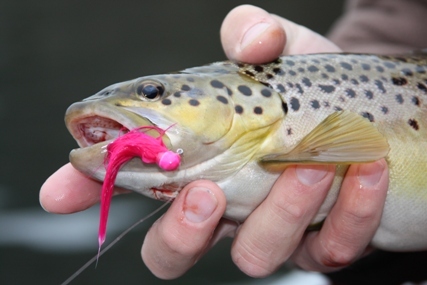 ​Over the years several lures have become 'the' classics for trout fishing . One such lure is the Acme Kastmaster spoon. Fishing a Kastmaster for trout is not unlike fishing any other small spoon however their design is a little unique. There are literally thousands of different spoon designs available from simple shaped copper to much more complicated shapes and expensive materials. The Kastmaster sets itself apart from a lot of other spoons by virtue of just how thick the body of the lure is. Because of this thicker body it quite heavier than other trout lures of a similar size. This added weight makes it great for casting and getting down into deeper water. You don't need to have a tackle box full of different color Kastmaster's or a full range of sizes either. With just a handful of these lures you can cover just about any situation. The gold Kastmaster is the go to color kastmater of choice. If you are working a new stretch of river or a small lake that you do not know then the gold is the first one you should try. It can work well on both over cast and bright days. It is easily the most popular and has landed thousands of trout over the last 50 odd years. On duller days silver can be more effective than a gold spoon. On a brighter day a silver lure can be a little bit too reflective for picky trout. If the water happens to be running a little high after a heavy spell of rain the brighter silver can be better when worked through the darker waters. The above gold/silver versions are the most important colors to get. After that you can branch out into some of the patterned colors. Colors such as Fire Tiger, Brook Trout and Metallic Perch are all good performers especially on larger rivers or small lakes where there is a natural supply of small baitfish or minnows for trout to feed on. As mentioned above what makes a Kastmaster a little unique among spoons is the thick body. The thicker body for the surface area of the lure makes it comparatively heavier than other similar sized lures. Extra weight on a small lure means much longer casts on lighter gear. 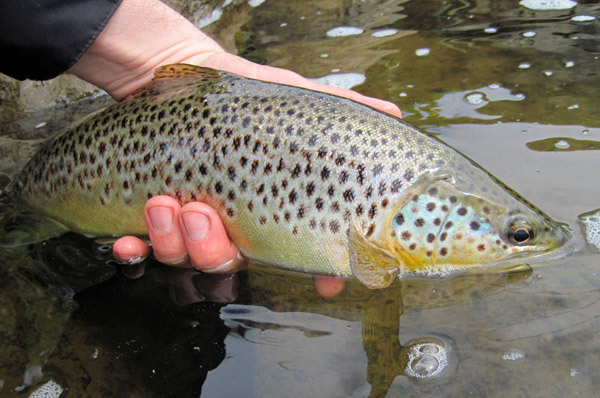 On small rivers and streams you should aim to find out where the trout will be hiding out. 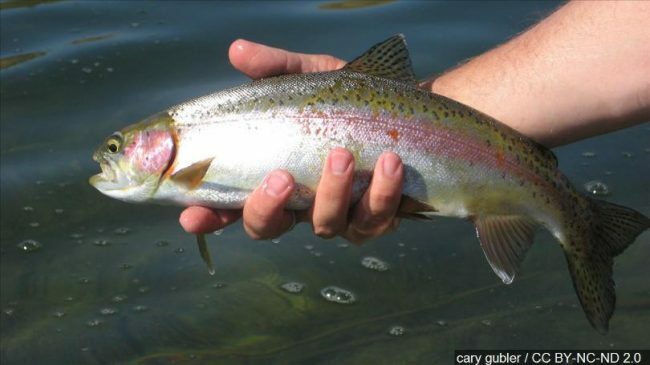 Trout love to wait around in deep pockets, run offs and eddy's or pools. The have a habit of waiting for small insects or minnows to float/swim past as the current over powers them. Once you have identified a potential spot where you think a trout might be waiting it is then time to start working the lure in the right way. With a lure like a Kastmaster how fast you retrieve it is crucial. Too slow and it will sink and snag on the bottom. Too fast and you may not get any strikes. A fast retrieve can also effect how the lure swims. It should have a very pronounced wiggle that sends out pulses through the water. One of the best ways to find the correct speed it to work it right on the surface on a calm stretch of water. You should be a very defined ripple behind the lure as it cases a small wake. You generally do not need to go much faster than this. As soon as the Kastmaster hits the water on your cast you can control how deep it goes by a quick count before you start to retrieve it. In really deep water this count might be as long as five seconds. In shallower water you may not want to wait. Instead you can start to pull it in as soon as it hits the water. Obviously a slower retrieve will make the lure run a little bit deeper than a fast one. You need to experiment a little with the speed depending on what size lure you are using. A super quick retrieval speed will generally work the lure just under the surface. Just be careful not to go too fast or the natural action of the Kastmaster will be lost. Although you can use the smaller Kastmaster lures on ultralight spinning gear, sticking with a light to medium sized setup is probably best. For rod selection a 6.5 foot trout spinning rod with a fast action should fit the bill. Reel selection will usually be decided by your line rating so a 6 pound line used in conjunction with a sized 2500 spinning reel for trout would be a perfect match for the rod. If you intend to troll using a Kastmaster then you will want to up the size of the lure and also your setup. A trolling setup with heavier line and perhaps the use of a downrigger may be needed depending on just how deep you want to go. ​Look in almost any trout tackle box from the last fifty years and you are likely to find at least a few rooster tail lures. Rooster Tails for trout have been the go to on small rivers and streams and have caught thousands of trout all over the world. ​It's flashing blade is a great attractor both visually and from a vibration standpoint, whereas the rear hackle give a very realistic movement and helps to hide the treble hook from easily spooked trout. 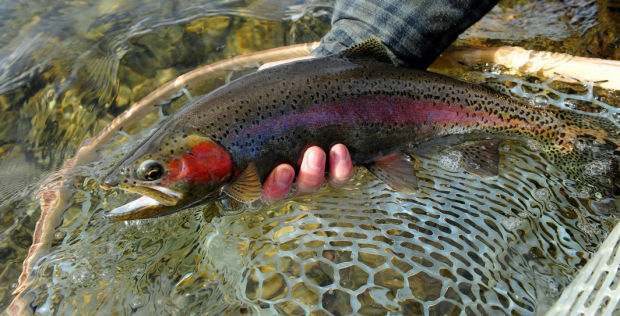 ​Trout will generally respond best to the most abundant food source that is in front of them. For example if there is a large number of nymphs moving from the bottom to the surface to hatch into some for of adult insect then a picky trout will ignore pretty much anything else you put in front of them. ​"Matching the hatch" is certainly true if you are fly fishing but it can also be replicated when using a trout lure such as a Rooster Tail. ​In darkened waters where trout are hunting with sound and vibration more than sight a flashier Rooster Tail with a bright blade and a fluorescent hackle can be far more productive than a natural patterned one. And conversely if there is a lot of insects about on a clear day then using a darker more natural pattern will best. In these instances the brighter lures may actually spook fish. What Size Rooster Tail for Trout? If you happen to fishing a much large river that is 10 feet or deeper or are planning on trolling for trout then you can use some of the larger sizes that are available. Rooster tails are pretty simple lures just like any other spinners. Color selection is probably the most difficult thing to get right when fishing a Rooster Tail. The colors that you choose as mentioned earlier will be generally be determined by the weather and light conditions on where you are fishing. The classic blade colors are either silver or gold. 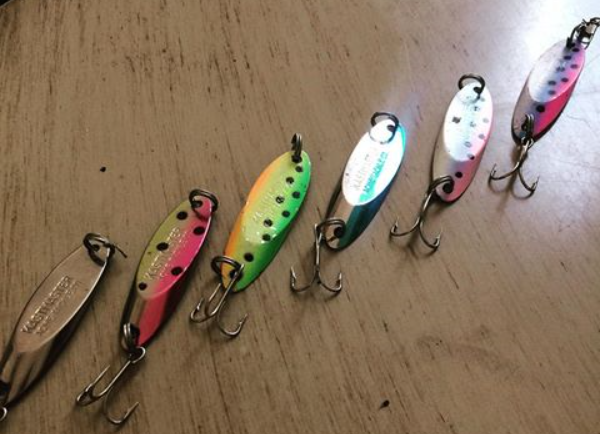 However, there are some patterns available that are painted onto the blade that can be used to imitate the natural spots in smaller bait fish the live in rivers. Blade color is best determined by light conditions. A black, silver or gold blade on brighter days or in really clear waters. And, on duller days or dark run waters you can use some of the brighter artificial colors. The hackle can act as a great imitator and it is what ultimately gives the Rooster Tail lure an edge over more simple spinners such as a Mepps. Again on bright days aim to use the darker more natural colors such as black or olive and in low light scenario's you can opt for something a little brighter. Just like using most other spinners Rooster Tail fishing is all about using light tackle to get the most accurate and delicate casts. Precision is key and accurately casting a Rooter Tail to put it right upstream of a trout is what will be most effective. If you are fishing a new stretch of water try to cast from one bank to the other in a fan like pattern. This will allow you to cover the most water. Be on the look out for sunken tree branches, deep pockets/holes and where faster moving water meets slower water particularly on bends in the river. Working these lures a few feet upstream of a trout as it lies in wait for it's next meal is the most effective approach to fishing with a Rooster Tail lure. A fairly standard light to ultralight spinning setup can be used with a Rooster Tail spinner. Rod - 5.5 to 7 foot trout rod depending on how big the stretch of water is that you are fishing. Look to have a light to ultralight power rating with a fast action. Reel - A good spinning reel for trout is when using a light setup is a size 1000 up to 2500. Line - Usually mono in the 2 to 6 pound range. Throwing small lures on light line takes a certain amount of finesse. The best trout spinning rods will tend to be small, light and ​have a fast action. By all means if you are seeking out larger trout on trolling gear then choosing a high quality reel will be generally more important than the rod. However, if you are using an ultralight setup for trout on smaller waters the it is the rod that is the most important piece of tackle to get right. What Type of Spinning Rod for Trout is Best? The best trout spinning rod available on the market right now is hands down the Ugly Stick Elite. If offers the best performance for the money than practically any other rod in it's price range. ​If you been using spinning rods for trout over the last two decades then you've surely either used or seen an Ugly Stik rod. Their massive popularity is built on providing near high end performance at a very affordable price. They are also built tough too. I've seen Ugly Stik's take a lot of abuse. Far more than some of the pricier brands such a G. Loomis or St Croix. The original GX2 line of rods were a massive hit. And so too has their replacement line the "Elite". Like the GX2 series the Elite are built to a simple design but with a very high quality manufacturing process. The new rod blanks boast 35% higher graphite levels which result in a lighter rod with even greater sensitivity and action. ​Every aspect of the rods have been tweaked to help save weight. The Ugly Tuff guides are a one-piece design without inserts. Dropping the inserts means less weight. And, assuming you don't damage the guides also means slightly less drag on the line during casting. These rods also come with a high quality cork handle, stainless steel reel hood and 7 year warranty. They have one of the biggest ranges available with ultralight, light and medium rods available at several different lengths from 4'6" up to and including 7'6". ​Fenwick have positioned themselves firmly in the mid-range of the trout rod market. Their Eagle line of spinning rods boast a wealth of high quality materials resulting a very well balanced rod blank. ​Built from SCII graphite the rod blanks are a result of decades of testing and refining graphite rod construction. In fact it is Fenwick who first brought graphite rods em masse to the fishing world. The Eagle comes with a burled cork handle which is less chip resistant than traditional cork. Stainless steel guides and inserts are used throughout. If you are looking for a well balanced rod with a great tip action then look no further. Like the Ugly Stik above there is also a large range of sizes to choose from, which tops out at a rather large 8 foot in length. ​Just like Fenwick, St Croix offer a high quality range of trout rods that aim to span the middle ground between price and quality. ​The Triumph series prides itself on having some of the best rod actions available for ultralight trout spinning rods. Made from premium SCII graphite, the rod blanks have been finely tuned to provide the perfect blend between action, power and tip sensitivity. If you are looking for a rod that lets you know just what is going on at the hook then look no further. Tip sensitivity is extremely important when using small lures. A dull, lifeless heavy action will mean more missed strikes, getting the taper right on the rod blank is crucial. The Triumph series are not all about the rod action though. They line guides a reel seats are top notch. A premium grade cork handle, hardened aluminum oxide guides and a Fuji DPS reel seat round off a very high quality rod. ​If you are looking for the very best trout rod available then the Trout series from G Loomis is it. Bear in mind these rods are considerably more expensive than every other rod listed here. ​Given it's price tag the G. Loomis Trout series is not for beginners. I have one and they are a serious step above almost everything else I have tried. Feather like performance and a clear and extremely crisp fast tip action make them perfect for the lightest of setups. Small jigs, nymphs and F3 Rapala's are easily managed with maximum feedback available through the rod. Casting is always an issue on very light gear and the Trout series makes it easy. These rods reel like a fly fishing rod they are that well balanced. ​The St Croix Freshwater Trout series is a lighter more high end version of the Triumph mentioned earlier. As a comparison a 7 foot Trout series weighs only 3 ounces, whereas a 7 foot Triumph series will weigh roughly 4.2 ounces. ​A combination of weight and action is usually how an ultralight set up is judged and this is what St Croix do well. If you are on the look out for a rod that can be used for the small of finesse style fishing then you won't put a foot wrong with the Freshwater Trout line of rods. ​A great budget option the Celio Trout series from Okuma is a solid little performer for the money. If you are choosing a rod for a kid or are looking for a decent second rod that is easy on the wallet then you can't go far wrong with one of these. ​The graphite rod blanks offer a great combination of light weight and decent sensitivity. Although these are a budget option ot by no means mean they are "cheap" in terms of quality. As stated above your best bet on rivers, streams ad small lakes if choose an ultra light spinning setup. Once you know the size of lure and line rating that you will be using the most often you can then match your rod and reel to them. The most popular length for a trout spinning rod will be roughly 6.5 foot. A really small creeks, rivers​ and streams you can will find some fishermen that will drop down to a rod length as short as 5 foot. Rods of this length make life a whole lot easier if you are fishing off of banks that have a lot of tree branches and bushes. On much larger faster flowing rivers you can go all the way up to a 7 foot rod. A longer rod has the ability to cast heavier lures a longer distance. So if you are using heavy spoons or spinners and are looking to cover a lot of water then the extra length is probably better. For most people however a 6.5 foot rod is more than suitable for the average river or small stocked lake. Casting lighter lures on light line means that you need a rod that will load much higher up the rod blank. This, combines with better sensitivity is why you should use a fast action trout rod. Although we have listed three main types of actions manufactures have designed a lot of rods to operate in between the actions. So, for example you can have a slow/medium action and a medium/fast action. Slow action rods start bending lower down in the blank. This is fine if you are through larger lures a long distance. But, it also means that the tip will not register a delicate strike as easily as a fast action, which can result in losing some fish. Power effectively means how hard it is to "bend" the rod. Or in other words what size fish will you be looking at catching. The power rating will have a direct relationship to what weight line you should be using. Traditionally rods were made from split cane, then as technology developed and more modern materials became cheaper they were built from fiberglass. Both of these materials are a little too heavy for a light trout spinning rod. Modern day trout rods are a usually made from graphite. Graphite is extremely light and can be manufactured in a way that gives a very consistent performance. The one drawback to a graphite rod is that they can be very easy to break if stepped on or mistreated. Fiberglass poles however can take a lot more punishment. You can find some spinning rods that are a blend of both fiberglass and graphite. Some fishermen prefer this as they claim it gives the performance of a graphite rod blank with the feel and durability of fiberglass.